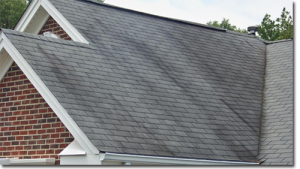 What should you know about the black streaks on your roof and how did they get there? You could find article upon article about the next and newest magic chemical someone is trying to market and get rich quick over promising unremarkable results. Many people would rather skip the chemistry lesson and the biology research on roof algae and other living organisms that are on their roof and hire a true professional. 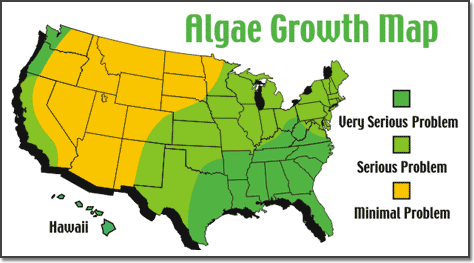 Here’s a quick guide to educate our consumers on roof algae. Well it’s Alive! Yes! Those ugly black streaks known as roof algae or the scientific name Gloeocapsa Magma, has gained notoriety in the Southeastern part of the United States. This particular type of cyanobacteria is responsible for creating black stains and streaks on roofs. The bacteria accumulate over time as it feeds on moisture and calcium carbonate. This accumulation begins to show the black stains as the cyanobacteria develop their dark and hard UV-protective outer coating. These stains take months, or even years, to appear, but once they are present they are here to stay, living and feeding on your roof shingles. So how did they get on my roof you ask? Well you could thank your neighbor or someone in the area, algae spore are thought to break free and become air born and land on your house. These algae spore set up shop on the North Side of your house, as they begin to feed on your asphalt shingle. Every rainfall or moist weather forecast causes an increase in the growth of the roof algae / Gloeocapsa Magma. 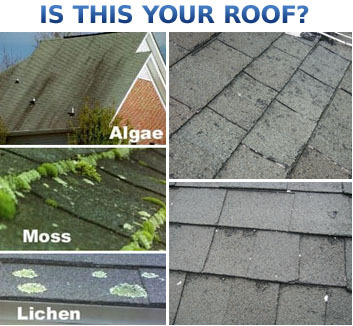 This formation of roof algae can be noticed streaking towards your gutter line. As our climate in New Jersey and surrounding areas begin to warm our problem with roof algae begins growing as well. Roof algae: more than just a curb appeal problem. Roof Algae will eat years off your roof by feeding on the limestone filler in the shingles. Over time your roof will have premature aging, rotting, and granule loss. Roof shingles are designed to reflect sunlight and keep your house cool in the warmer months. As the roof algae become larger growing in size so does its black UV shield. The larger the black stain the more heat absorption from the sun. The heat from the sun becomes trapped in your roof; thus, warming your attic and raising your electric bill. Maintaining a cool household temperature in the warmer season becomes a difficult challenge for any AC unit. A constant running AC can be a strain on your wallet. Aqua Boy Power Washing knows your property is your single largest investment. Each year in the US homeowners spend billions of dollars maintaining the exterior of their home. After all the hard work of painting, gardening and decorating don’t let your property be robbed of its beauty with roof algae. These stains can be seen from down the block and are unsightly to look at. Aqua Boy Power Washing Soft Wash system will kill the roof algae, remove the stains and restore your house back to a desirable look. Next time you pull up in your driveway, you’ll be glad you called. Why use a Soft Wash Roof Cleaning system and not just Pressure Wash? What goes into cleaning a roof properly? Why can’t I Pressure Wash it? First, roof cleaning and pressure washing are two very separate techniques with very distinct equipment. 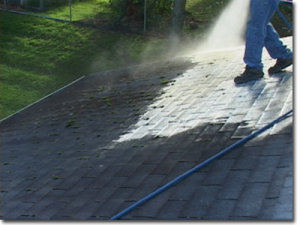 Pressure washing a roof takes years off the roof life and voids warranties. Pressure washers are designed to clean and break free grime and other stains with the use of force or PSI (pound per square inch). This unregulated pressure is the damaging factor and the wrong way to clean a roof. Aqua Boy uses State-of-art-equipment Soft Wash Cleaning coupled with the correct cleaning agents. In fact, the correct chemical usage is the main facet in cleaning a roof properly. Pressure from the unit in the Soft Wash Cleaning System has very little to do with the end result. A Soft Wash System only delivers about 65 P.S.I, as much as a household garden hose. Roof cleaning misconceptions about chemicals and the right way to professionally clean a roof. There are a vast amount of opinions on chemical usage and proper techniques regarding the right way to clean Roof Algae. Chemical companies and former roof cleaners have tried to come up with the magic formula, pushing the safety chemical on the market. Some Power Washing Companies had a brief idea that they could incorporate this rapidly growing business as another service, but as the business of cleaning roofs quickly expanded so did the knowledge regarding the right application for roof cleaning. Now more confusing then ever we have the “Anti Pressure Companies” or “Just Say No To Pressure Washing Companies” out in the market. Aqua Boy Power Washing LLC is a full service Power Washing and Soft Washing Company when we arrive at your property we can handle all your needs, without the catchy slogans and magical roof cleaning formulas. Aqua Boy will take the guesswork out of your cleaning needs. We have invested in the very best equipment, chemicals and professional staff. How do we clean roofs? Why is Aqua Boy right for the job? We carry the correct amount of insurance for this type of work. Aqua Boy’s safety standards and practices are second to none. We follow OSHA guidelines while operating on a roof etc. Our staff is trained, uniformed and educated on roof cleaning and power washing. Without the proper safety equipment on hand we would rather lose the job then operate in an unsafe manner. You will always find at least two workers on every job, especially when cleaning a roof. We are not a “Splash and Dash Company” meaning apply the chemical and explain to the homeowner that the rain will takeoff the rest. Beware of those practices! Our relationship with our customer and your overall experience is vital to our future existence. Aqua Boy Power Washing works with many different realtors in the New Jersey area enhancing curb appeal by removing those unsightly black streaks. Potential buyers will turn away considering that a particular house or property on the market may need a new roof. Aqua Boy Power Washing professional cleaning system cost about 10% of what it cost to replace a roof. Cleaning a roof requires proper set up. Checking your entire property making sure windows, doors, pets and children are secure. The safe guarding of your flowers, plants, trees, shrubs and lawn is one of our many safety procedures carried out by our company. Proper cleaning techniques are always followed on each and every job we perform. Aqua Boy will deliver the final results a homeowner can be proud of. Contact us for a free estimate. We will spend the time to answer all your questions and concerns.